Spring is the time to revitalize and get moving, but also a time to improve our immune systems so that we can avoid wind-caused health conditions that often proliferate during this season. One way to start is to begin each day with a congee to tonify digestion and thereby help improve our immune function. You can check out what deficiencies your patients have and advise them to put certain foods into the congee. Generally, I advise a few slices of ginger be put in the congee each time. In addition to the ginger, one can add yam or sweet potato, carrots, or squash along with brown rice and millet as the grains because those foods help boost spleen/stomach qi. If the person is more kidney deficient, they can add a little garlic and mushrooms and perhaps use a combination of small and large beans to boost their kidney energy. Giving patients "congee advice" is an easy way to get them started with food therapy and after you get them eating congee, you can have them add herbal formulations to the mix. Lately, I have been reviewing the book "Shaolin and Taoist herbal training formulas for Chi Kung, meditation, the internal martial arts, and longevity" written by my mentor, Jim Ramholz. I have been looking for revitalization formulas to use with my fertility, fibromyalgia, and other patients who need core renewal. Several of these are shared in this article. Tai chi tea (aka Ten complete great invigorating herbs tea) is one of the oldest formulas known in the world of Chinese Medicine to improve general vitality. Some say that is the "perfect" formula. Since this formula improves qi and blood as well as general vitality it may be used to treat chronic illness or any deficiency symptom. According to the book, the formula named Huang Ti's Choice is "reputed to be the favorite herbal preparation of Huang Ti, the Yellow Emperor." The formula promotes balance and is said to improve longevity, tonify qi and blood. It is said to tonify "all of the internal organs" while "providing extra yang energy to the lungs and extra yin energy to the kidneys." This particular longevity formula can also be taken long-term because it is balanced and mild. Even though flu season is probably mostly over by spring, it's still important to pay pretty close attention to the food we eat because the right food choices can help boost immunity. Eating too much sugar stresses our system so reducing sugar intake can be a great first step to staying healthy. Our body's detoxification system (including kidneys) can only process so much sugar and when it can't process it and properly eliminate it through the regular mechanisms, it can lead to symptoms like acne. Highly refined starches (e.g. pasta) can basically have the same effect on the body so it's good to try to minimize eating too many foods in that category. Cod liver oil, garlic, ginger, and oregano are supplements that can have beneficial flu-fighting effects too. Patient education about how our medicine works is so important and that includes counseling them about the energetics of food. Information about their qi works and gives them the power to change their lives rather than just coming for treatments and depending on us to "make them better." Further, as I'm giving nutritional information to others, I am reminded of the importance of paying attention to how we nourish ourselves. Just like acupuncture can minimize the negative effect of stress on our bodies so can proper food energy support. 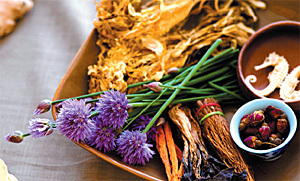 Keep qi balanced and immunity strong with food and herbs.